Knit Whimsy: It. Was. Ugly. Remember way back here when I mentioned having waited months for some Tosh Sock yarn? Remember how excited I was about the colorway? And so, we ripped. And we were glad. Now, if I were more dedicated to my craft, I’d have done all the maneuvers necessary to carry my stripes evenly through the heel and ankle. But yeah, considering I’m grateful whenever I manage to finish anything these days with my day job sucking all of the knitting life out of me, I’m happy to live with the pooling at the ankles. Don’t judge me. I’m itching to cast on a sweater for myself and have one picked out but will share that with you another time. I’ll be waiting until after Christmas to begin it anyway. I’m so grateful I get to see my son and daughter-in-law and my mom this year who are all making the trip down for a few days AND I have actually managed to score the week off of work. Yay! 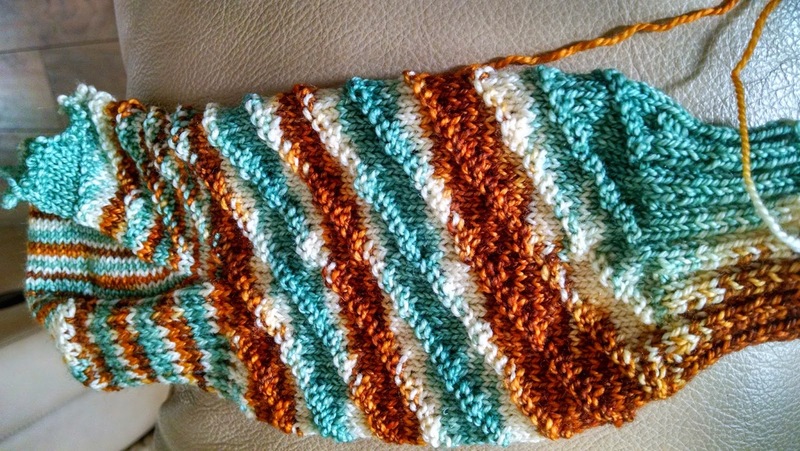 In the meantime, I’m working on a sock design and some smaller projects that I can get off the needles quickly. I completed one a couple nights ago. 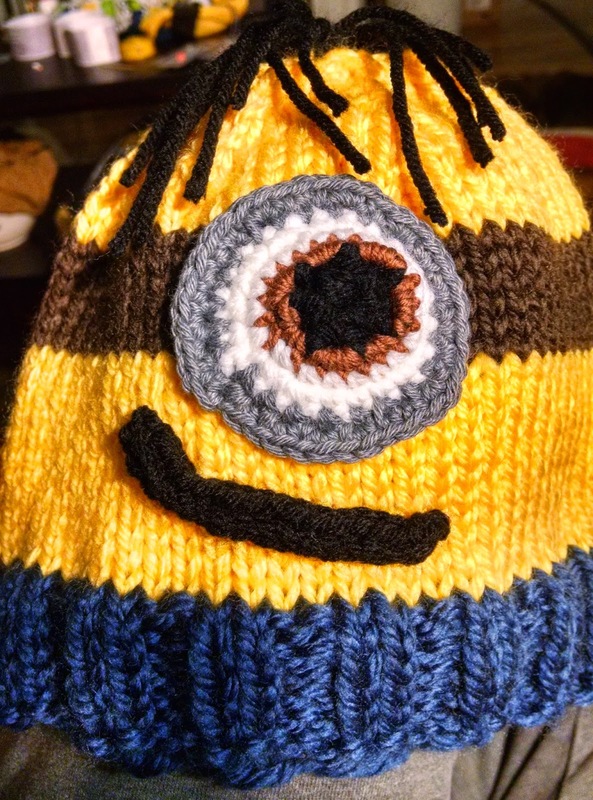 It’s a Minion hat for my boss’s son. I used Cascade Pacific Chunky (which I really liked) for the body of the hat and then various bits I had around for the embellishment. The eye looks wonky but I never claimed I could crochet worth a darn. P.S. - What’s the ugliest thing you've ever made? 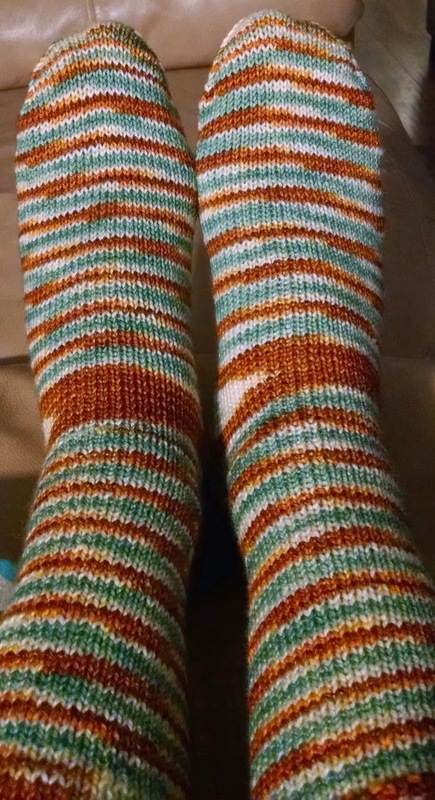 Before I read your post I looked at the socks and thought the pooling was perfect and in just the right part of the foot. I'd call it a design feature. I admire anyone who knits socks. It simply doesn't appeal to me, but I have learned not to say "never". A design feature! Awesome! And I never thought I'd knit socks either, but once I started, I can't stop! SO...... suffice to say, I like your second socks better than the first pair. :-D I have a difficult time trying to envision how the colors in a skein will translate into knitting projects. I wish there were some set rules to give an indication on how to precede. The second socks are fantastic! Wow. That was insanely ugly. I'm really glad you started your blog post with that title or I'd have been super worried. But the simple pair is lovely, I even love the pooling!! But. The Minion. MINION!! Minions are insanely awesome, and that one is adorable! Especially the wonky sideways smile. Love. It. PS - Your comment thing won't let me comment via Google. Darn technology. What's it say when you try to comment?